About BRET EASTON ELLIS (Author) : BRET EASTON ELLIS is a published author. 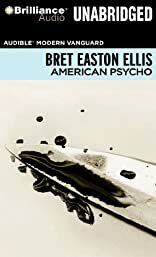 Published credits of BRET EASTON ELLIS include American Psycho and AMERICAN PSYCHO. About Pablo Schreiber (Reader) : Pablo Schreiber is credited in . A published credit of Pablo Schreiber is American Psycho.